The Phillies were beginning to give new meaning to the phrase “Day of Rest” after losing their last 9 Sunday games. It has been less rest, and more of a coma. But today a miracle occurred and they won a Sunday game, beating the Diamondbacks by a score of 4-2. Yippee! Roberto Hernandez had a very good day, allowing only 2 runs over 7 innings. I should qualify that by saying he had a good day pitching because, have you seen this guy swing a bat? He looks like a 3 year old holding a 20 pound piece of lumber. At one point, he actually swung at a pitch after the ball was already in the catcher’s glove and the catcher was reaching in to take the ball out. Seriously. But hey, nice job on the mound, Roberto! And thanks for the extra entertainment. The offense was kicked into gear by Ryan Howard, who is out to prove something after being benched for 3 games earlier this week. He smacked a 2-run homer in the 1st inning; it was his first homer in Philly since June 1st. Howard was also involved in a home plate controversy later in the game. After not immediately hustling around the bases on a Marlon Byrd fly ball, Howard finally sped up when the ball was dropped. While he should have been out at home (by a mile), the out call was overturned on replay as the D-Backs catcher was blocking the plate. While I am happy the Phillies got the run, I have to say this home plate no-collision / no blocking rule is utterly ridiculous. No way should Howard have been safe, but he got by on a technicality. Can’t we just go back to bowling over the catchers and be done with this silliness? 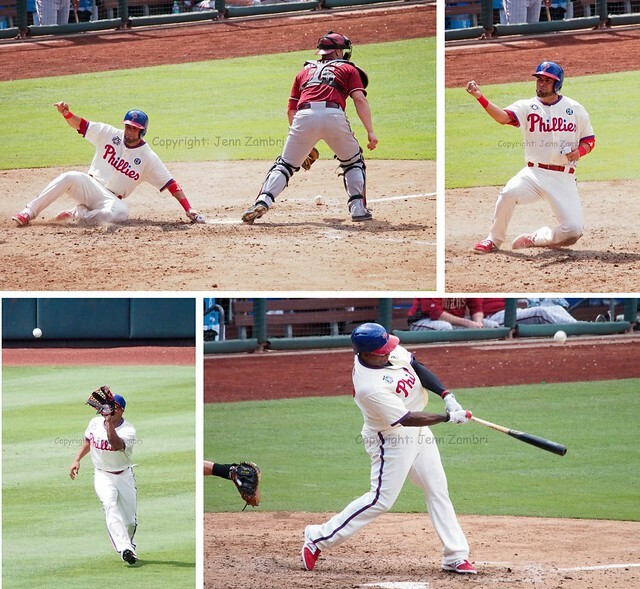 So the Phillies did go on to score another, non-controversial run as Wil Nieves scored on a double by Ben Revere. And yes, the Phillies managed to win a game with only 4 hits, thanks to several D-Backs errors. The Phillies defense was solid and kept them in the game. There were some other great non-baseball moments today, including armed services members being honored, as the Phillies do every Sunday. But this one almost brought everyone to tears as a little boy was reunited with his mother after a deployment and video of the boy crying hysterically were shown on the big screen. Kudos to the Phillies for a very touching moment.